Home » marketing stunts » publicity stunt » salman yatra.com » yatra travel » yatra.com » Is Yatra’s Domain Expiry a Marketing Stunt? Yes, It Looks Like! Is Yatra’s Domain Expiry a Marketing Stunt? Yes, It Looks Like! Recently, Yatra.com, a popular travel portal, has received all media attention because they seem to have forgotten to renew the domain name. As a consequence, the site portal was down for a few days, and they incurred business loss apart from facing users' wrath. The question is – Is it a real loss to the company due to domain expiry issue or a well-planned strategy for publicity stunt? It’s no wonder to know that some companies may go very far to get noticed, and resort to such marketing stunt for FREE publicity. When advertising cost is too high, and loss is too low, to bear, such ‘guerilla marketing practice” is commonly pursued. This practice is not new. We see such marketing stunt year after year. There are companies such as SonicYoga.com (Year of Stunt -2002), Half.com (Year of Stunt -1999), PokserShare.com (Year of Stunt -2006), Vodafone (Year of Stunt -2002), and Sony (Year of Stunt 2005) that have already used guerilla marketing tactics for publicity stunt. And, now it looks like Yatra.com (Year of Stunt 2013) has joined the list. The company reported a loss after tax of Rs 8.18 crore in the last financial year (2012). They have always followed the principle that TV and digital media works better than print advertising. They focus on SEO, Social Media, PPC and Google AdWords extensively for traffic generation. If we look at the Google Trends, the interest of users searching ‘yatra.com’ is declining since 2010 onward. What if FREE publicity and wide media coverage get them more benefits than temporary loss due to domain expiry issue! 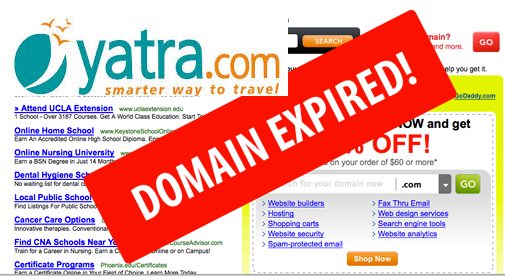 Domain does expire if not renewed but for spammers, not for serious business owners like Yatra.com. Never heard of any incidence of domain expiry for big, medium and even small companies. They mostly follow auto-renewal policy. Any sensible company selects an ‘auto-renewal’ option. Even if some of them don’t, then the hosting provider sends enough notification starting a month or two about the expiry of domain. Yatra.com spends heavily on TV and online media. I’m sure their technical team or SEO team must have notified them since the company has a dedicated digital marketing team. Manish Amin (domain registrant) may forget and ignore such notification but how come Yatra.com’s dedicated digital marketing team? A Yatra.com statement on social networking sites said, "We are facing some technical difficulties with our DNS servers on account of which some of you are unable to access our site. We are working on this and hope to have it resolved in the next couple of hours. For any urgent cancellations or rescheduling, call us at 1860-5000-500". The statement has gone viral on social media because they knew it well that such trick would explode. They seem to have succeeded in their attempt for a wide publicity. By now, the website traffic, the interest and popularity among users must have increased by leaps and bounds due to high attention the company has received from all media including print, social sites, and other digital channels. Many media, I have seen, have reported that MakeMyTrip and GoIbibo.com, the arch rivals have gained due to such technical issue faced by Yatra.com. Yes, they might have gained but it should not matter much at time when their digital presence is relatively on higher side compared to Yatra.com. See here a comparative study - http://goo.gl/2YPy4p. I chuckle at media persons, not because they are non-techie but they are journalists. They love to create a story, and jump on writing, and publishing anything based on their initial review, and study. Congrats to the entire team of Yatra.com for weaving a well-craft marketing tactic for publicity stunt! You have made some noise, we have heard it now.